This Tablecraft 1500 9 1/2" white spatula is a perfect addition to any bakery. A plastic handle with end loop hangs conveniently for storage and offers a secure grip. The standard temperatures rubber blade is heat resistant up to 140 degrees Fahrenheit. I really like this white spatula. It is just a basic utensil, and you get what you expect. Overall, it is high-quality, and I would recommend it. This is my go-to spatula for the bottom of the peanut butter jar. it's also great for spreading just about any frosting or spreadable product. The plastic is decent enough quality, but I don't expect it will last excessively long. Still a good purchase for the price, though. THIS IS ONE TUFF SPATULA I BOUGHT IT FOR ONE PURPOSE ,TO REMOVE THE HARDER ICE CREAM FROM THE BOWL OF THE ICE CREAM MAKER BOWL...YES IT WORKS. This 9 1/2 inch white spatula is a great kitchen tool. It's handy for smoothing icing on cakes and cupcakes. Great product for the price. We own about 20 of these. They're the perfect, little spatula. They've got a great handle. Nothing too fancy about it; it's basic. Does the job. The spatula is very durable. When washed it doesn’t melt. It very good size for scrapping sauces, dressing, and stirring. I recommend it and also want you to know it will save you money when ordered through webrestaurant! These are nice stiff spatulas that work well with our thick batters. Some of the other spatulas I have purchased elsewhere bend when I a m trying to mix our thick batters so I am very pleased to have found these on Westaurant! I will be purchasing more. I purchased several of these spatulas. Good size but not very flexible. Also, after several uses have discolored and some are starting to peel so have to throw away. Tablecraft spatula with a thin and very firm head which can be used for spreading viscous things like icing. Much firmer than other common spatulas. Perfect size for scraping out smaller cans and jars. Inexpensive, yet fairly durable. At this price I wont worry about breaking or losing a few, will just replace and keep on cooking! These are great to have around the kitchen. The handles can crack pretty easily, so recommend having a few backups. They are priced accurately for what you are getting. These are so handy to have in the kitchen! We use these for mixing our soft serve ice cream with mix ins. The handle is thick and easy to grip and the spatula as sturdy! The Rubber end is just right in flexibility without being to flimsy. Excellent and economic buy for a really basic but necessary kitchen utensil. Great for getting the last bit of anything out of the jar! Will be a money saver. It does exactly what we need it to do each and every time that we use it. It is high quality for such a low price. We just ordered another set of these and can not wait until they get here so we can put them in our other kitchens! we have purchased this brand scrapers many times and they are a good commercial grade scraper/spatula. we mainly use to tranfer dips and icing to a smaller bowl. This spatula is very affordable. It is small yet sturdy. I use it whenever I need to ice a cake or a cupcake. Easily fits into containers of frosting. The 10" White Scraper is such a great and nifty little spatula. I have a few of them, and I think I am going to buy some more. this is a nice spatula for quick and easy jobs. we've mixed soap, scrubs and many other skin care products with it. the plastic doesn't strip or melt with strong chemicals. This 9 1/2 white spatula broke after a very short period of time. I would not recommend this product. Spend a little more money for a higher quality option. Thank you for your review, Hannah! We are sorry this Tablecraft 1500 9 1/2 inch White Spatula has not worked well for you. A Customer Solutions Representative will contact you soon! We order two of these little spatulas and one of them has already broken. They are a good tool to have and fit into hard spaces, but they aren't overly durable. Love this! Helps me get every last drop out of anything because of its small size. Easy to clean! highly recommend...money saver for sure and cheap! While this is not good for stove top cooking, it is a good little spatula for non hot cooking projects and scrapping bowls/pots, etc. I like the narrow end that allows for fitting into cans and smaller items. Small spatulas are needed too. Not always we have big cans, this mall spatula scrapes almost all the content from the container very practical and easy to use. The Tablecraft 1500 9 1/2 spatula is very sturdy and durable. However, it does not meet the purpose I purchased it for. My intended use was to scrape out jars and small bowls, but it does not do this well due to the inflexible stiff sides. If it was a bit wider and flexible it would be great. Now, it is taking up space in my kitchen. The 11 1/2 Sandwich Spreader, Item #: 280CR926WEB, also sold by Westaurantstore with its long handle and flexible sides is perfect for scraping out jars, bowls, and making sandwiches. Getting frosting inside of a small pastry bag can become extremely annoying. That's why I am glad to have this small spatula that will fit easily inside the bag while filling. This use, among others make this a good purchase. Great size and length for this scraper. Works great to scrape out jars with smaller rims. The scraper is firm, but pliable enough to flex with the vessel. These spatulas have a nice skinny blade that fits into almost any container. The blade is solidly attached to the handle. The blade is not very flexible at all, but does work well for mixing etc. These are cheap and it is nice to have a bunch of these around if you are mixing up multiple colors of frosting/icing. What a versatile little scraper. Perfect for getting that last little bit out of smaller cans and containers. I've used it for months and it's held up nicely. The thin blade on this 9.5 inch spatula is great for cleaning bottles and glasses with narrow openings. This spatula is white in color, and it can be stored via the hanging hole for convenience. The spatula is very thin and precise. Quality is decent, and the price is very low. It is a bit specialized in application, but if you need one (or even think maybe at some point you will), it is nice to have. The Tablecraft 1500 9 1/2" White Spatula #6901913 is a great item that performs well without being too long or bulky. great price too. I'd recommend. This is the perfect sized spatulat for getting into bottles and jars to scrape the last of sauces and condiments off the sides. Small and stores easily. This is a multi use tool that can be used to scrape down the sides of a bowl during baking or used to ice cupcakes or cakes. We have quite a few of these small wite spatulas. They work so well for cleaning out our baking bowls to get out as much product as possible. The overall strength of the spatula is great. Unlike the flimsy ones, it keeps its shape when it gets warm. I especially like how it is small. I am able to use it to get out the last bit of sauce in a jar. I highly recommend buying one. Seems a bit cheaply made but for the price I can't really complain. Great for scraping the inside of small jars and such. You can't go wrong for the price I suppose. This is a great tablecraft 9 1/2" white spatula. This works great for scooping out blenders do to how slender this item is. The spatula bends with slight pressure scooping all that's intended. I do not love this little scrapper, it is very rigid with very little flexibility which makes it difficult to scrap the sides of a bowl or container to remove the last contents. It would probably be good for mixing, but that wasn't why I bought it, so it's not really a useful tool for me. The price is very good though so I don't feel like a wasted a ton of money. I use this spatula for frosting mini cupcakes but, it is quite versatile. It is very sturdy and it doesn't stain easily. I really like that it has a hole in the handle. I hang mine on my knife rack so I always know where it is. The 9 1/2 inch white spatula I use all the time when baking because it gathers up all the excess batter with ease. I really enjoyed this product. Great little spatulas for a number of things. We use them for spreading sauces and stirring sauces. There easy to store and clean. Highly recommend for the price. Perfect household and kitchen gadget to scrape the remaining product out of a mixing bowl. Its small enough to get in the corners of jars and bowls. Its also made with a flexible, but strong plastic that holds up well to hot and cold products. You can't beat this for the price. It's not super heavy duty, but it's held up well for what it is. Buy two at this price and you won't have to wash one in the middle of baking. Really fantastic tiny spatula is perfect for those small baking projects. The go to spatula when looking to ice or frost those pesky mini muffins or cupcakes! 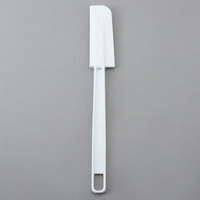 The Tablecraft 1500 9 1/2" White Spatula is a very nice item to have in the kitchen. You can use it for making a cake or even pancakes. The quality is really good as expected being a Tablecraft item. This spatula is a really good deal. Highly recommend! These are very strong so they are very handy for mixing. I love the easy to clean one piece design. I find the size to be perfect also. This mini spatula was special to be able to spread the nutella in our dishes. And helps not to waste product. Good quality and low price! As they say you get what you pay for, the tblecraft spatula is not something I'd order again, it is very stiff and no one in the kitchen likes to use it. We appreciate your feedback, Gloria! If you ever have any questions about the products you purchase, please reach out to our Customer Solutions team. This spatula is the right size and length to free up stuck food that gets caught around the blade assembly in our blender container. I love this spatula. It is high quality and the perfect size to fit in pretty much any jar or container. This product is a must for any kitchen. Great spatula for smaller jars! The top part is half size so it will get anywhere you need. You will also appreciate great quality and even better price. Pretty nice spatulas. Easy clean up. My only complaint is that the warning "not heat resistant" should be marked in a different color than the handle so it stands out more. Just the right length, blade width and heft in the hand; construction / molding is nice and clean, great all around tool. And the price is unbeatable. I like the quality and price of this spatula / scrapper from WEBstaurantStore it's perfect for getting batter or sauces out of a mixing bowl or condiments from a jar. Scrape the sides of bowls easily with this spatula. Easy enough to handle and long enough for mixing bowls to get a good amount of product per use. These spatulas actually measure close to 10" which is fine because the size isn't why I bought them. I wish they were a teeny bit softer than they are. I love these spatulas! Sometimes you just need a little one to mix a small batch of icing with coloring and these are wonderful for that! Its perfect for those hard to get corners in containers. I purchased several of these and plan on buying more soon! This is a great spatula, and at this price, excellent value. It's perfect for cleaning out the mayonnaise jar, peanut bar jars, etc. Also great for getting everything out of the food processor. Great skinny spatula! Buy a few you will not regreat it. They are strong and hold up well with everyday use. Remember these are not for high heat so it you happen to try to stir something that is frying in oil they will melt. Buy a few you will be happy. I use these little spatulas for my soap and bath product making business. They come in hand for scraping out lotions and stirring in ingredients. Wash up nice, good quality for the price. Nothing really special about this spatula. It does it's job and works great with getting things out of cans. The size is great to have on hand when you need to get into little spaces! Never miss a bit of cake mix, pie filling, or other batch of stuff again. This little spatula is great for wiping the slate, bowl, or pan clean. And, it does well for spread out mixes into tight corners i.e. brownies. This narrow spatula is exactly what I have been looking for! It has a long enough handle to be comfortable to use, but is narrow enough to clean out standard size peanut butter or mayo jars. This white spatula is great quality! It holds up well under heavy usage and it is almost indestructible. It's impressive and overall a great buy. This 9 1/2" White Scraper work well with cake batter and icing. It easy to use. And clean very easy from the buttercream icing. Great price a great product. 9 1/2" White Spatula is great for smaller jobs and tight spaces. It cleans well and one is just never enough. They are a great price as well! Excellent for scraping the insides of bowls and we have even used them to apply toppings and icing to food. Well constructed and durable and matches our other spatulas and utensils. It's funny how something so simple can be such a game changer. This spatula is the perfect size for getting that last extra bit out of jars and has already paid for itself in the first week. Surprisingly good quality for the price too--I might just have to pick up a 2nd! Although I very much like the price, I find the ability of this spatula limited by the fact that it is so stiff! The actual spatula part seems to be made of the same material the handle is, meaning it's going to be very difficult to get a good scrape down on a bowl or curved shape anything! As a cake decorator myself, I wouldn't recommend this for use with icing, it just doesn't fit the bill. However, if you are looking for a handy spatula that you could use to scrape out food from straight sided containers (think canned goods like tomato sauce, tomato paste, sour cream, yogurt, peanut butter) then this is your tool! I have found it very useful for this particular function! Three stars because it's just not your all around awesome spatula, and the fact that it can't eff chivalry be used for the task it was made for. This is a pretty good little spatula. The narrow blade makes it practical for scraping jars or other containers with small openings. I deducted one star because the blade has very little flexibility, which makes it not as useful in some situations. However, for the price I think this is still a good value overall. The best use for this spatula is getting every last bit of product out of the jar or can! The narrowness and slight flexibility is great. The white spatula is just like the description. It looks like a regular spatula cut in half. The end tip of rubber is smooth and a little less flexible than I expected. The overall quality is very good. This is the perfect size spatula to get into any small jars and the blade is plenty stiff. I do wish that there was a high-temperature rated spatula in this size but for the price this is a must in any kitchen for the size. This is a nice spatula spand the price is really good . We are always happy to find webstraunt store prices are very competitive with other vendors. This is a really good size to get into jars or containers and get all the product inside and keep from waste. Holding up to everyday use. Very similar to another spatula we had, this one appears to have a smoother, better finished edge. I like the length of the handle, it's comfortable to use. This is one of the handiest items in my kitchen! It fits in even the smallest can (think: tomato paste) to remove every last bit of food. Love it! I bought several of these spatulas to use when mixing coloring into small amounts of buttercream and it works great. They are sturdy and durable. The price is unbeatable. 9 1/2 inch white scraper meets your basic needs for the kitchen. Feels solid. Withstands minor heat, and cleans up easily. Can not beat the price. Not crazy about this scraper, it is hard or firm and does not have much flex to scrape out bowls. Very good to clean out jars. Nice scraper. It's long and thin, making it especially good for scraping out jars. I probably should have purchased two instead of just one. Definitely a good value. Every baker needs an assortment of spatulas. For heavy product or large amounts, you need a rugged hard spatula to speed recovery and loading of pastry bags, and effective cleaning of bowls. This one is nice for small bowls. This spatula is fantastic to have in your kitchen. I use it for getting in the bottoms of jars, and to mix salad dressings. The price is grand, and I wash this separent as not to have dishwasher detergent on it. Storing is nice in your baking drawer or a crock on your counters. Love this spatula. I use it the same way I use a dough scraper. It is very strong, sturdy and firm and handy for mixing and scraping my sourdough and containers. I will definitely order more. Great product and great price. Decent scaper for cleaning out small jars, etc. It is not heat resistant, and the plastic is not flexible at all- it's rubber, not silicone. I prefer the silicone versions of the same tool. On top of looking very pristine and pretty in my kitchen, this thin and petite 9 1/2 inch spatula is a very practical everyday tool. I use it for mixing and scraping. I especially like the fact that it can fit into most cans to scrape off ingredients where other spatulas can't fit. It is also a firmer spatula which adds to its sturdiness. These little spatulas are great for scrapping out small containers and other tight spaces that larger spatulas just cannot fit into. They are strong enough to handle just about anything and flexible enough to effectively grab the last bit of jam from a jar. This spatula is great due to it's skinny scraper...works great to scrape food out of small jars. Since it doesn't absorb the color of the food into the rubber, it can be use on most foods. This 9 1/2" Spatula is perfect for all my in home baking uses. It is narrow and can easily fit in jars and cans to get every last bit from a container. It also scrapes batters and doughs easily. The spatula is strong and made of quality materials. I've had mine for some time and it still looks like new after many dishwasher washes. Perfect spatula for getting in to those long hard to reach spaces. The only issue I have is that it is not very flexible. The actual blade doesn't give much so it's hard to scrape the last bit of whatever is in the bottom of the jar. Still, a handy tool to have in any kitchen at a great price. I wanted/needed smaller rubber spatulas so these are nice to have. They are sturdy but not super flexible like what I'm used to. I use these spatulas to stir up melted chocolate or sauces. These spatulas are a great deal for the price. I order them by the dozen. They work well for getting things out of small containers, mixing up small amounts of colored icing, etc. They do start to wear after several uses and sometimes take on the color of the icing, but for this price I just toss them and replace them when they get too worn. Can't beat it! I have been very happy with this spatula. It's the perfect size for getting into those tight spots. I have not noticed any discoloring from the diswasher and it has not become brittle on me. Everyone needs a spatula to get to the bottom of that can, jar or even sometimes in between the beater of your mixer. I'll gladly keep mine! You can never have enough spatulas. This is small but very handy, sturdy and practical in the kitchen. And the price is very good too. I love the size and how skinny this spatula is so it can scoop out of glass jars. However, it tends to break very easy after a few uses. I bought about 8 of them but now I have less than half of them left are not broken. Disappointed of the quality. Thank you for your review! A Customer Solutions Representative will be in contact shortly to offer replacements. If you would like to try a different spatula, check out the Mercer M35120 spoontensil which also features a slim design. This spatula is of excellent quality. The only thing I can say negative, is that I thought the handle was the 9 1/2". It is 9 1/2" for the whole thing. It stills works fine for what I'm using it for, so no issues there. The plus - the spatula is a nice heavy weight and is sturdy. The minus - it has absolutely no give/flexibility so you cannot scrape a bowl with it, and also tends to stain easily. I would not repurchase, but may be useful for stirring thicker batters/doughs. These are great for getting stuff into and out of small containers. We also use them to spread our calzone filling. The are sturdy and can't be beat for the price here at webstraurantstore. They do stain easily when using them with our red sauce but are great to have around. The spatula is a little smaller than I was expecting. We hardly use it at all. But it is a handy little thing to keep around if you need a really small one. Good quality, just small. I really like having this slender spatula around for getting the last out of small jars and buttering many slices of bread at once. It's also great for scooping thick hummus out of your food processor. I love the size and shape of these spatulas, although we have snapped several when using in thicker batters. Not sure if that's just us or the product, but for the price, you can't beat it! Thank you for your review! We're sorry that you received a spatula that did not meet our standards for quality. If you ever receive a product that does not meet your expectations, please contact us and we will do our best to rectify the issue. A Customer Solutions representative will be in contact with you to arrange a replacement for the defective item! This is the sort of spatula that I've found impossible to get singly in a big box retail store, but it's always the one that's used most often, gets chewed up in the blender scraping down shakes, and so needs to be replaced first. Get it here. Very nice scrapers they were of good quality and length to get things out of the bottom of jars, through small openings. The price couldn't be better. Great tool for hard to reach places, such as inside a Vitamix container. Helps scape out everything from the bottom, fits between the blades, length of spatula. It's my favorite tool. I use this for spreading butter and other items.i also use this for scraping batter from the bowl and blender jars.the long handle makes it easy to reach the bottom of the jar. I think this is a good spatula to begin with before adding the larger ones to one's baking collection. Although it looks small, it does the job just fine. Good quality product for sure. This is a great small basic spatula for daily use. It works good for getting prepped food out of small deli container for easy cooking. Handy little tool to have around the kitchen. Works perfectly for mixing in small bowls or getting foods out of small containers. Well constructed with a nice, sturdy feel in hand. Recommended product. This spatual is like one I bought years ago that had finally see its day. I use this for smaller jobs and it is great for jar scraping. Pricing is excellent on all products! Good quality spatula and sturdy handle. May want to order different sizes to ensure your hand doesn't get full of cake batter or other ingredients. This is a really handy little spatula. Great to use for smaller projects or getting into tiny spaces, it performs the job perfectly while being extremely affordable! I Love this scraper and I have a number of them, and use them all the time. Maybe could be a little bit more flexible. I particularly like the overall size of this spatula. It is very handy and always useful no matter what kind of thing I am making with it. For a little white spatula, these are really just fine. We've broken a good number of them trying to scrape out bins of buttercream, and have learned a larger spat works better for our needs. For thinner batters, I'm sure these are perfect. This is a nice firm bladed spatula. It also has the great feature of it being one solid piece, unlike a lot of spatulas that are made of two piece. Another thing to note, the blade is actually narrower then it looks in the picture. Perfect size and shape. It is firm unlike most store brought spatula. I use this for butter and it works better than any knife or spreader. To butter bread, muffin pans, or bake potatoes, this is the right tool.